Wedding Impressions: Make Your Bride Happy with Platinum Ride Limo! She’s imagined this day since she was a little girl. Her wedding is the one day of her life when she gets to feel like a celebrity, a superstar, a princess– and you know more than anyone that your bride deserves the best. Make sure she knows it, too by arranging a once-in-a-lifetime limousine experience. She will strut down the aisle like a supermodel on the runway after arriving with the best wedding limo service available in Phoenix, AZ. When your guests see a beautiful limo roll up, and your beautiful wife-to-be steps out, they will know that they won’t be forgetting this wedding anytime soon. Neither will your bride– she will forever treasure the day that she lived like a supermodel. Before selecting any mode of transportation for your wedding, define the theme and vibe of your wedding. 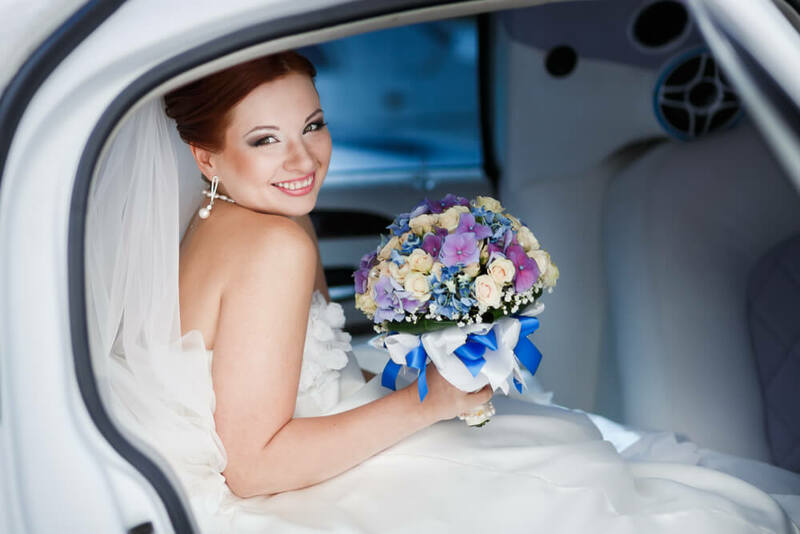 This will help you select the right type of vehicle and transportation accommodations for your bride and her bridal party. From elegant and classy to flashy and fun, Platinum Ride Limousines has the right wedding ride for you. If you’re planning an elegant, luxury wedding, you need an opulent ride to tie it together. Don’t skimp on quality service; our Phoenix limo service will make sure that your bride and her wedding party will have the ride of their lives with the safest, friendliest drivers. You can count on our top-notch fleet to give you and your bride a once-in-a-lifetime luxury experience. Does she want to have the best party of her life? The answer is simple: a party bus. Each one is unique, but ours are all are decked out with interior neon lighting and state-of-the-art sound systems. For an experience complete with a fireplace, try our Big City party bus. The Titan, G6, or Cloud Nine models offer front and rear plasma TV screens, so you can share memories of your relationship to set the mood before she and her bridesmaids arrive at the venue. If you want to go the extra mile, try one of our Party Packages, which by the way, are great for bachelorette parties too! She and her party will be decked out in beads and receive free champagne. Another option is to rent a stretch SUV. She and her wedding party can lounge like millionaires on fine leather seats. For an added interior bar experience, try our stretch Lincoln Expedition or Navigator models. Of course, you can never go wrong with a classic stretch limousine. For the ultimate luxury experience, try the Chrysler 300M stretch limousine with Lamborghini angel-wing doors. If you and your bride are aiming for an elegant, classy wedding, look no further than the Lincoln Town Car stretch limo. She will surely feel like a queen when she arrives to say her vows. 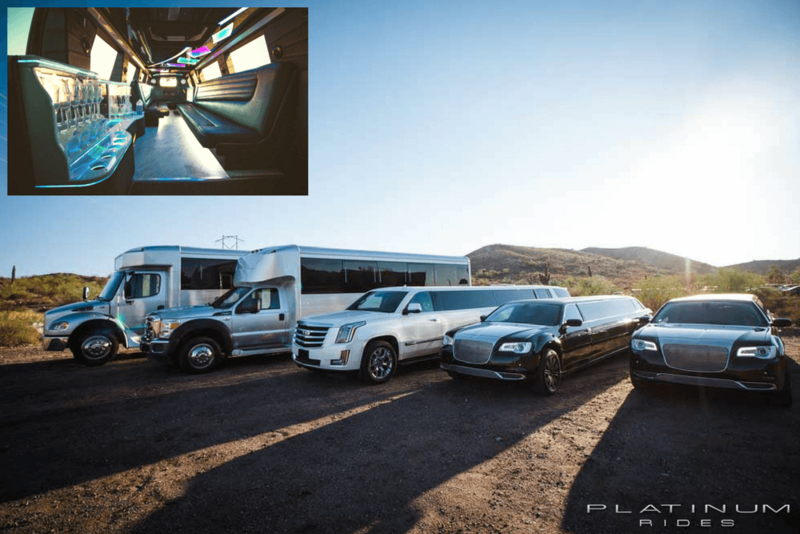 Before completing your plans for an unforgettable upscale wedding in the Phoenix, Arizona area, don’t forget Platinum Rides Limousines. It is our goal is to provide the best wedding limo transportation in Phoenix, guaranteed. After all, it is the first day of the rest of your lives together. Our top-notch drivers and classy vehicles are just the start of how we provide the highest quality wedding transportation in the state of Arizona. Book your wedding ride with us today!